A shoutout to the youth and the people of the Philippines! We used to be a great country, second only to Japan in Asia! We are naturally rich in minerals and natural resources. We are an artistic, intellectual, and inventive people. All of these are recipe for a great nation. But what has happened to us? We are now ranked as one of the worst. Our closest neighbors such as Thailand, and Indonesia, has overtaken us. Their economy is booming. Plus you add the fact, that we are the most English literate, and the most fluent English speakers in this region. What is stopping foreign investors, from bringing their investments here? Peace and order? Business environment? Government incentives? Political climate? Although our BPO (Business Process Outsourcing) sector is booming, the rest of the industry is declining. We use to manufacture most of our commodities, our products/goods, and agriculture. Now we merely import them. Most of our hair products are either made in Indonesia or Thailand, our milk products are either made in Thailand, New Zealand, or Germany, our RTW (Ready To Wear) items are made in China. When will we be able to proudly say, that our goods/products are “Proudly Philippine Made?” When will multinational factories sprout out again in the Philippines? Giving jobs and business opportunities to thousands or millions of unemployed Filipinos. Also generating more revenues from these multinational factories for the government. We have world class artist, designers, architects, engineers, etc., which have not only been featured here in the Philippines, but also around the world. We have great Filipino thinkers and inventors, such as Agapito Flores (inventor of the Flourescent tube), and Daniel Dingel (inventors of the hydro powered car), but because there was not support from the government, these inventors had either sold their inventions to companies or countries, who are willing to take their inventions seriously. We are a great nation and a great people, and we should not forget this. Our government and the people manipulating it, has caused this decline. If the government would have been proactive in keeping the peace and order situation better, making the business environment more susceptible to foreign investors/investments, giving incentives to these foreign investors/investments to entice them, and making the political climate more stable, then foreign investors/investments would surely flow into the country. But our government is manipulated by a few individuals, who are enriching themselves out of the toils of the people. Individuals who don’t care about the sufferings of the Filipino people, as long as their pockets are full. So that is why I am calling on the youth and the people of the Philippines, to wake up, and cast their vote this coming May 13, 2013 elections. We should properly choose the politicians who will put our best interest forward, and not theirs. We should vote for those who will fight for our rights. We should vote for those who will bring about positive changes to the country, and uplift the status of the Philippines to be at par with the best in the world. We should not rely on empty promises and propaganda of politicians. We are old enough to know, who keeps their promises, and those who don’t. We should not sell our vote, for quick cash, which in the long run would bring us more suffering. We should be aware and take action in safeguarding our ballots, from the hands of unscrupulous, and dirty politicians, who will do anything to win. We should safeguard our future, the future of our children, and the future of this great nation of ours. Let us not be complacent, let us strive to show those unscrupulous and dirty politicians, that we will not merely watch and do nothing. We should stand up, and take action. Let us help ourselves help the nation. If the nation is great, then it’s people are great as well. Let us be part of the change! The change for the better!!! Conspiracy or Coincidence? You decide. I do not know, if most of you noticed, that the incidence of fires in Metro Manila, and other provinces has been steadily increasing. This past week alone, there were reported to have been around 10 incidence of fires in Metro Manila alone. Isn’t it quite coincidental, and convenient? Some people died in the fires, while hundred of families were left homeless, and left around P5 million in damages per fire, as the fires were mostly in shanties or squatter areas. And after the fires were put out, here comes the gallant, and honorable politicians, promising to help all of the families affected by the fires. And they keep saying, that they are not campaigning, but merely helping out the distressed, and just being kind hearted. But isn’t it convenient that after the elections, these so called gallant, and honorable politicians could not be seen anywhere after the fires have died down? Where is their drive to help the distressed after the election? Has it flown away, like their promises, and propaganda? Or are they too busy filling their own pockets, with the money from government coffers, budgets, or pork barrels, to care anymore? Plus the cause of these fires, are most of the times, suspicious. Were they caused intentionally? If they were caused intentionally, what was the motive or objective of the arsonist in question? Were the arsonist hired by these politicians to cause the fire, in order for them to look gallant, and honorable, in the eyes of the voting public? If this is true, don’t they have any conscience? What if the fire they caused claimed lives, as what happened to one fire in Tondo. Are our politicians heartless? Or are they just willing to do what has to be done, to look good with the voting public? I really love the Philippines. It is the country of my birth. But sometimes, incidents, and events makes me think. Am I safe? Is my family safe? Are my relatives safe? Can any politician just kill someone, and get away with it? I also want to point out, the supposed shootout incident in Quezon province. Even the Justice Secretary Leila de Lima, doesn’t believe it was a shootout, but a rubout, as per her statement. From this incident alone, came evidence of similar incidents, perpetrated by the same man. How come this man, is free despite the numerous questionable cases against him? Is he being protected by someone higher up in the government? Someone in the Senate? Office of the Vice President? Office of the President? Department of the Local and Interior Government? There has been rumors circulating among chat rooms in hushed voices, that the person in question is a hit man of the main controller of the illegal numbers game, Jueteng. Jueteng is an illegal numbers game, mostly patronized by the poor. But the income from these illegal number game is not paltry. It is estimated to run in the hundred of millions per day alone. You compound that, and it is in the billions of Philippine Pesos in a month. A sum worthy of killing people over, and over, and pay to cover up the story, so that the general public will hopefully forget about it. Wake Up Filipino! My Poor, Poor Dear Countrymen! My poor, poor dear countrymen! What is to become of us? I have this usual habit of reading the daily papers, listening to the AM radio, and watching news on television. And all that I see bade bad news for all of us. From the news about the elections, to the use of the AES (Automated Election System) or the PCOS (Precinct Count Optical Scan) machine of the COMELEC (Commission on Election), to the unscrupulous tactics of politician vying for position in the coming May 2013 elections, to the various fires that has hit the country, and the pounding of Tropical Depression “Crising” of the Mindanao area. These news worries me, but not as much as what has transpired and will be transpiring soon. Just last week, petroleum prices went up by as much as P1.50 per liter, on top of the already expensive petroleum prices. And just this week, reports or news of an impending energy rate hike approved for this coming March, and the impending water rate hike to be approved for the month of July. All of these hikes are taking a toll on the Filipino citizenry. The wages of the ordinary Filipino has not increased in proportion to the increases being implemented by the petroleum, energy, and water conglomerates. How will we cope with all these hikes coming one after the other? The increase in petroleum prices, will definitely affect all of us one way or another. The fares in public transport will definitely increase as well sooner or later. The prices of basic goods such as vegetables, fish, and meats, will surely increase as well, as the cost of transporting these goods has increased. The prices of prepared foods will surely increase as well. The approved energy rate hike for this coming March, will surely add another burden, to the already heavy burden the typical Filipino family is already carrying. The use of the television, which is the only form of entertainment of most typical Filipino family, will be limited. The use of the electric fan, the air conditioner, the refrigerator, and other home appliances will also be limited, causing undue inconvenience, and discomfort to all members of the typical Filipino family. The impending water hike due for July, is another heavy burden. We, the Filipinos, is one of the most hygienically conscious people in the world. We regularly take baths, some of whom take two (2) baths a day, to cool ourselves down from the extreme heat of the Philippines. We regularly brush our teeth from two (2) to three (3) times a day. We hand wash our clothes daily. We wash our kitchen utensils pots, and plates, after every meal. The use of the bathroom is common among all households, to relieve ourselves. All of these requires the use of water. The thing that irate me is the wages/salary of the typical Filipino, does not increase as much as the increase in the prices of these utilities. The already tight budget of the typical Filipino household, would be even more tighter with the introduction of these price hikes. I pity the typical Filipino family. I pity all of us. Only a few of us are unaffected by these price hikes. But the majority of us, the 99%, will surely cringe, and suffer. Why is the government doing nothing, to help alleviate the lives of the majority, the 99% of the Filipino? Are we not important enough to be given notice? Are we minuscule to be noticed? Are our sufferings too little to be significant enough? When will our government act? When shall we taste an easier, more convenient, and more relaxing life? Will we taste it when we are dead or dying? Its time for our government to act. Its time for us to wake up! Its time for us to choose the people, who will lead us to a more greener pasture, a more easier, a more convenient, and a more relaxing life! Wake up Filipino! I have traveled a lot, to different countries/cities, and I have notice that there is great disparity between us, and some of our closest neighbors. We are being left behind by our neighbors. Let me sight some examples. In Hong Kong, there are free wi-fi connections in public areas, such as public parks, and public libraries. Even buses have free wi-fi connection, although you have to accept the terms and conditions to access the free wi-fi connection. In Hong Kong and Singapore, the public transportation system is impeccable. The trains are clean, on time, and well ventilated. There is seldom traffic congestions in the roads. Safety, and cleanliness, are perfect. You can walk around in the wee hours of the morning, and you would not be scared of getting mugged or hold up. We shouldn’t allow ourself to be left behind. We should accept technology, and the advancement it provides us. We should have had an internet capable government offices, if the ZTE broadband deal was to have been completed, but due to the discrepancies, and the uncovered corruption of the Arroyo administration, the deal was dropped. We should have quality roads and infrastructures, due to the donations and assistance of our neighbors such as Japan, but due to corruption, and self enrichment, we are left with dilapidated roads and infrastructures. We should as a people, be wary of the people who govern us. We should be wary of the mistakes they have committed in the past, and not forget it. We should not vote for those who should not be voted. We should as a people guard our freedom, our future, and our country from enemies not only foreign, but also domestic. We should vote for what is right! We should vote for politicians, who will bring about positive changes to our country, bring advancement in technology, mass transportation, health care, and other fields. We should vote for politicians, who will give us jobs, food for our table, shelter for our families, and education for our children. Make the change you want want to be! Start it with you! Technology and Elections, do they co-exist or should they co-exist? In my previous blogs, I have pointed out the benefits of technology in our daily lives. Now with this blog I am pointing out how technology can affect, the stability of the country, and also the lives of its citizen. The advent of technology has made our lives easier. From smartphones, which we depend not only to make calls but also to take picture and upload them to our Facebook or Instagram, to smart TV’s, which not only shows us TV shows but also allows us to surf the web, to smart appliances, such as smart fridge which not only keeps our food fresh but also informs you by sending you an SMS, when you are running low on eggs, milk, or orange juice for your next grocery shopping. Now I am blogging about how technology can adversely affect the stability of the country, and affect our lives as well. The 2013 election is coming. This election is where we vote for Congressmen, Senator, and local officials, who would be the ones coming up with laws, and pass bills, which would either make our lives easier or harder. The COMELEC (Commission on Election) said they would be using AES (Automated Election System), to make the elections automated, easier, and safer. But there has been news circulating that the AES is not yet perfected, and has flaws/bugs. It is also touted to be hack free, but that information also seems to be false as well. Will we be relying the future of our country, our children, our lives on this untested technology? Don’t get me wrong, I am not against the advancement of technology, and it’s benefits, but if the technology has not been tested and would affect all of our lives, then I am against it. That is why, I firmly believe in the advocacies of, Mr. Raul T. Concepcion, which is the GOVT Watch. 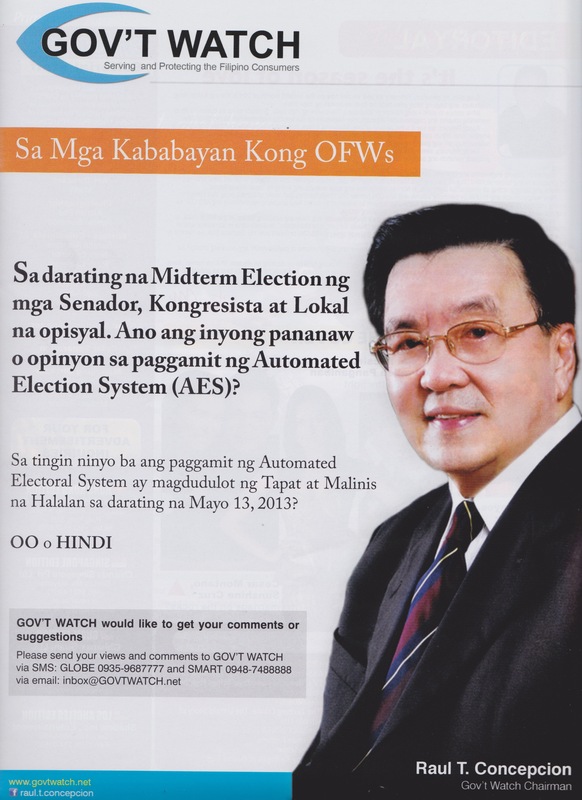 Would the use of the AES bring about clean and honest elections in the coming May 13, 2013 elections? I am asking you, readers of my blog, to send your views and comments to the details provided above. Take your stand and show that you care! Care for yourself, your children, your future, and the country! Let us show the government, that we want to be part of the change of this country! A change for the better!